Breath was programmed by Shinichi Iova-Koga, artistic director of San Francisco-based physical theater and dance company, inkBoat, and included shakuhachi master Masayuki Koga, dancer Dana Iova-Koga, vocal duo Ghost Lore (Tim Kim and Katherine McDonald), and live calligraphy painting by Aoi Yamaguchi. Dancer Iova-Koga’s untitled solo was by far the night’s most captivating performance. Her lithe, travel-through-evolution dance managed to be gripping, humorous, heartbreaking, and searingly honest. McDonald’s vocal accompaniment provided a subtle partner. Beginning on the floor — frustrating some people because the large audience tucked into the museum’s back atrium reduced sight lines — Iova-Koga extended her left leg. Her bare foot, crooked and displaying wrinkles and soft gray dirt picked up from the floor, quivered with vulnerability. Or maybe it was simply a primordial experience of breath passing through a body that moments later swam, surfaced, briefly squatted, and sauntered like a gorilla before gaining verticality. With a blink and deliberate, two-second stare-downs, Iova-Koga established that a human being had arrived. Astounding in it’s subtlety and with each progression achieved in mere seconds, the solo progressed through a panoply of human history: self-awareness, celebrity, athleticism, gun violence, lust, industrialization, objectification, gender identity, automation, and on and on. Her gestures suggested society’s full spectrum — a friendly wave to people outside the museum who paused to look through the windows and elicited delighted laughs from the audience; a “forgotten” left arm extended to one side as if encircling the shoulders of a companion while the right arm competed for attention by flagellating and engaging in a busy, repetitious, dehumanizing chore; an invisible cell phone held in one hand that moved to her face and became a blindfold and an allegorical gesture whose meaning was clear in our era of preoccupation with mobile devices. If it sounds cliché-ridden, it was not. Impeccable timing and a choreographic arc that made each point but never overstayed the moment made evocative, organic statements. The end, with a return to the floor, left Iova-Koga lying on her side, back to audience, ribs expanding and contracting as she breathed, her upraised thumb and pointer finger separated by centimeters in a “pincher” position as if to suggest that this small space, this gap, is where our last breath remains just before life ends. It was a remarkable performance. Impressive also was Masayuki Koga, displaying control and power in three songs he performed on the Japanese flute. The shakuhachi’s rich tone makes it a pleasing instrument to listen to. In the hands of a skilled professional, warm color blended with raw texture to extend its range. 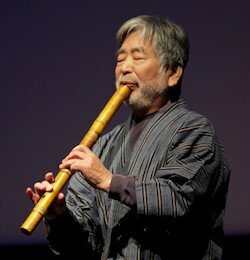 In “Ancient Wind,” Koga built an improvisational piece from non-Western and non-Japanese scales that he said were “emotional scales.” Breath was three-dimensional: heard at his mouth, within the flute, and in the notes filling the atrium.